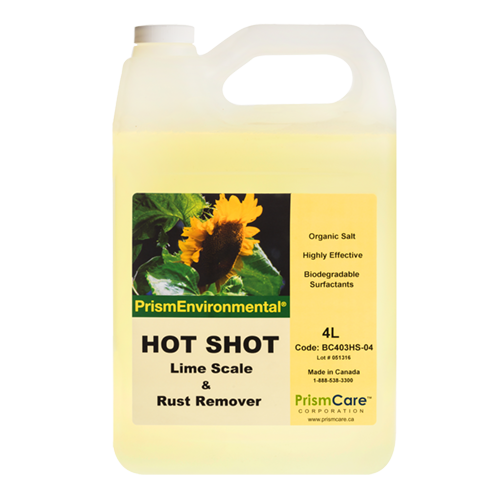 PrismEnvironmental® Hot Shot Lime, Scale & Rust Remover is a heavy-duty, low-pH, organic salt alternative to hazardous, hydrochloric acid. This concentrated product will rapidly clean and remove lime scale, rust stains, soap scum, mold and mildew, in addition to dirt and grime from toilet bowls, urinals, bath tubs, tiles, grout, and water fountains. Hot Shot is a safer product that will not damage most carpets.